Today we honor Mother Teresa on what would be her 100th birthday. 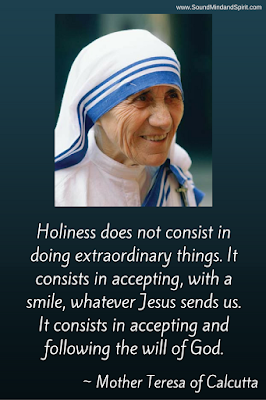 We are truly blessed to have been witness to this Saint’s life in our own lifetime. Yet what did we learn from her? How can her life be an example and inspiration for our own? "The poverty of being unwanted, unloved and uncared for is the greatest poverty. We must start in our own homes to remedy this kind of poverty." Not how much we do…. But how much love we put into the action. It’s not about going out of our way to do extra for someone, it’s as simple as putting love into every simple daily act for others. A sincere smile for someone you pass in the hallway. Holding open an elevator door when you see someone approaching. Listening to your child tell about her school day. notice it’s closer to empty. full basket in a crowded grocery store line. How many small acts do we perform every day without being conscious of the love found within the action. We can all battle the varied types of poverty found in our daily lives. 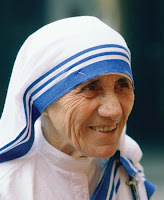 Mother Teresa’s true lasting legacy in our world? She made people feel wanted and loved. 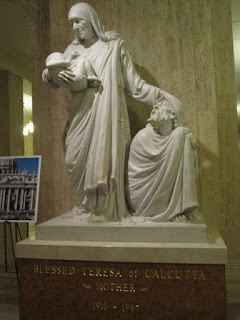 Mother Teresa was an amazing woman!